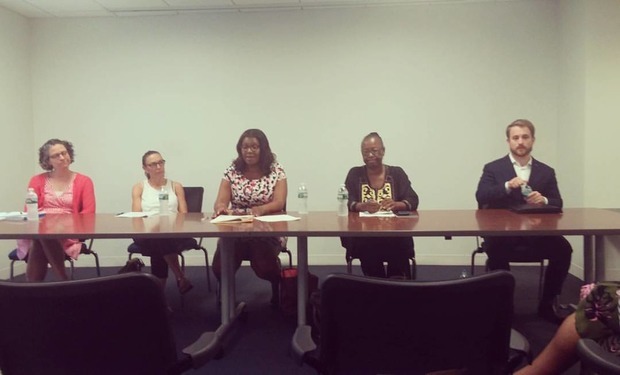 Some of the most fraught issues faced by the Bushwick community were front and center last week at Rats, Cockroaches, Landlords: Housing in New York City, a panel discussion hosted by the New York City chapter of the Women's Information Network. The well rounded group of professionals who took the stage to share their perspectives included the City's Public Advocate, Letitia (Tish) James, Aaron Carr, the founder of Housing Rights Initiative, Bertha Lewis, the founder & president of The Black Institute, Ismene Speliotis, Executive Director of the Mutual Housing Association of New York, and Jessica Yager, the executive director NYU Furman Center for Real Estate and Urban Policy. The discussion centered around recent developments in affordable housing within NYC - including the East New York affordable housing plan spearheaded by the de Blasio administration under which the city plans to build both at market and below market in one of NYC’s poorest neighborhoods. “[You] can’t build affordable if you don’t give developers their drug,” noted Bertha, explaining that the new plan—which the panelists agreed does little towards addressing the city's housing needs— isn’t tailored specifically to East New York, where the median income is $32,000, stating that of the roughly 4,000 units slated for the area, only 25% of them are available for $31,000 and under. James, who moderated, recently made a case to the short term rental marketplace startup AirBnB, submitting testimony to its Chief Product Officer regarding evidence that the platform has no safeguards against racism. Citing studies done by Harvard School of Business, James noted that guests who have “names that are distinctively African American” have a lower response rate, and that non-black hosts earned approximately 12% more than black hosts, which James believes could be addressed by eliminating the sharing of profile pictures and names entirely before a booking transaction occurs. In addition to AirBnB’s lack of oversight on the potential for racially biased user interactions, local politicians, advocates, and independent data analysts also find that entire apartments being flipped and used for AirBnB year round threatens housing security for other residents of the neighborhoods such practices occur in. “[AirBnB] is taking a lot of affordable housing off of the market, too,” added James. When asked if there’s any hope for affordable housing in NYC, panelists were quick to affirm that there certainly is, stressing the importance of being critical, particularly of de Blasio. “Don’t be a stranger in your building, don’t be a stranger on your street,” said Lewis in her closing remarks, encouraging us all to engage with one another, especially on theses types of issues. Indeed, we can't possibly understand one another if we aren't listening and communicating.